Introducing the amazing Microlab S325 Soundbar. This powerful and versatile soundbar will enhance your movie watching experience. Made especially for use with your widescreen TV, this awesome sounding Microlab S325 Soundbar is a ‘must have’ for any movie fan. We all know how poor standard TV speakers usually are, so why not improve the quality of the soundtrack? You may already have upgraded your DVD player to a state of the art Blu-Ray player, but what’s the point without upgrading the sound too? NOW is the time! The powerful Microlab S325 Soundbar, with FreeStyle design, and V16 and S12 speakers designed by Peter Larson. Dynamic sound effects projection and full range acoustic spectrum this high fidelity system oozes quality and precision technology. •	Wall mounting brackets included. •	Twin S12 long throw 3” woofers and full range drivers designed by Peter Larsen. •	Top panel controls plus LED display. 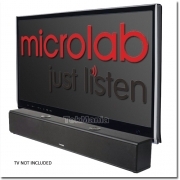 •	Microlab eAirbass technology for firmer depth and resolution. •	28 Watts RMS output.